✔DURABLE: The backpack is made from water repellent nylon fabric, provide strengthen and long-lasting performance with minimal weight. Stress points are reinforced with bar tacking for increased longevity. Durable SBS Metal Zipper across the backpack.This Bag will Last for Many Years. MCIRCO is a professional office, home and outdoor product supplier, focusing on supplying all kinds of quality, stylish and attractive items to help improving customers’ high quality life. Our mission is to improve customers’ on-line shopping experience. 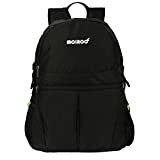 Feature: This is a great backpack for a trip or other outdoor activities, it holds a surprising amount of items. It is Water Repellent so it can work fine if you get caught in the rain. When you just need a small bag to hold your purse and phone, you can fold it into a single shoulder bag. With this backpack,you will have lighter baggage and bigger carry capacity.You will never pay for the baggage fee again. It’s small till you open it! Easy to folds into small bag. You would LOVE you can throw it in your suitcase and have an extra bag without taking up space. If you’re not 100% happy with your purchase of MCIRCO foldable backpack in 30 days, contact with us and return the backpack, we’ll refund your entire purchase price. Click the Yellow “Add to Cart” Button to Enjoy Your Happy Trip Now!